Exposing concrete to salt isn't always a bad thing, especially in the case of a rock salt finish-a traditional and easy method for adding subtle texture and skid resistance to plain or colored concrete. 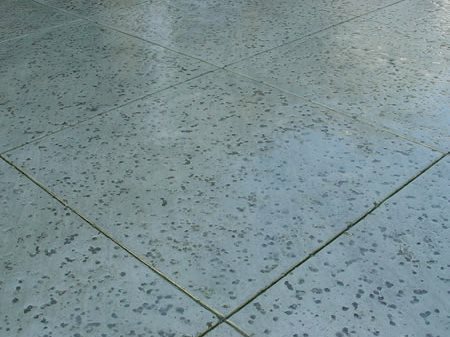 Considered a step above smooth or broom-finished concrete, a salt finish leaves a speckled pattern of shallow indentations on the concrete surface, similar to the appearance of slightly pitted, weathered rock. 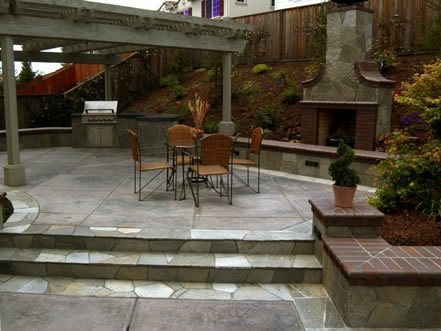 With the growing popularity of stamped concrete, however, the use of this finish has been waning, and many homeowners aren't even aware of it as an option. That's unfortunate because a salt finish still has a lot going for it and is far too attractive to be considered obsolete. While the pattern isn't elaborate, it has a distinctive look not achievable with any other method. Even better, the finish requires few additional tools and materials to produce, keeping the cost affordable for those who want decorative concrete on a budget. How to Create a Salt FinishAs the name implies, a salt finish is traditionally achieved with the same coarse rock salt sold for use in water softeners or as a deicer in winter. Concrete finishers broadcast the salt particles over wet concrete and then press the grains into the surface with a float or roller. After the concrete sets (typically after 24 hours), they power wash the salt away, revealing a speckled pattern of shallow indentations left by the dislodged salt particles. While salt imprinting is relatively quick and easy to master, there are newer methods that can speed up the process by doing away with the salt altogether (see "Ways to Produce a Salt Finish, Without the Salt"). Salt finishes are more commonplace in the warmer western and southern regions of the country. The reason: In areas subject to freezing weather, water tends to collect in the indentations and freeze, potentially causing spalling. But if you like the look and use good-quality concrete protected by a waterproofing sealer, a salt finish should be durable enough to endure any climate. For the best effects, use salt crystals 1/8 to 3/8 inch in size and press them into the surface to a depth about half of their diameter. Avoid producing indents larger than 1/4 inch, because they can be a hazard for people wearing pointy-healed shoes. To achieve the most distinct salt imprint, give the concrete a smooth finish before applying the salt particles. The amount of salt to apply will depend on the degree of pattern desired. For a light pattern, start at a rate of about 3 pounds per 100 square feet. Add more salt-up to about 12 pounds per square foot-to achieve heavier textures, similar to travertine. The most important thing is to distribute the salt evenly across the surface, so make sure you have access to the entire slab. Start working the salt crystals into the concrete at the right time-usually when the concrete is just beginning to set. A good test is to press your finger into the surface. The concrete is at the right stiffness when the imprint depth is about 1/4 inch. When washing the salt away, remove all traces to prevent surface discoloration, especially if the concrete is integrally colored. Don't apply a sealer until the concrete surface and the small recesses left behind by the salt dry out completely. Creative Ways to Use a Salt FinishSalt finishes are attractive alone, but are particularly stunning when used in combination with colored concrete and other decorative finishes. Some contractors who specialize in stamped concrete use salt finishes as an interesting contrast to stone and brick patterns. Landscapers have long relied on salt finishes to create rustic garden pathways with the look of natural stone. And the finish is still quite popular with pool contractors, because of its inherent nonskid texture. 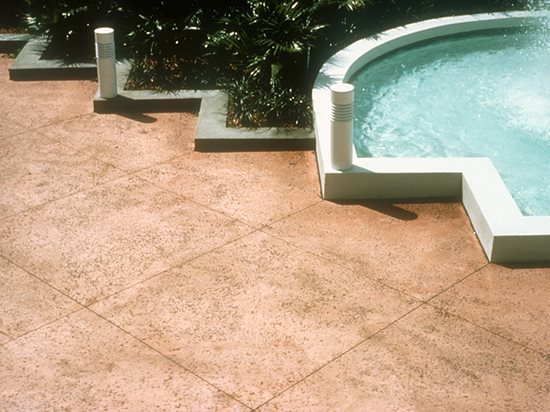 Natural rock salt finish used on a pool deck colored with a dry shake hardener. Land Design in Boerne, TX. CostFor homeowners on a budget who want something more interesting than plain or broom-finished concrete, upgrading to a basic salt finish will cost as little as $1 more per square foot. Of course, the price will be higher if the concrete is integrally colored or the project incorporates other decorative finishes. For contractors, a basic salt finish is very economical to produce. The only additional tool needed is a steel roller to press the salt into the concrete surface, such as this one from Bon Tool. These rollers can usually be purchased for around $100 and work with the same extension handles that attach to bull floats, so finishers don't have to step onto the wet concrete. For smaller projects, such as walkways, some contractors simply use hand floats or large-diameter metal pipes to press in the salt particles.